Irregular verbs in English are forever. No matter how you teach them, the students resist. I have already designed about twelve different ways to teach irregular verbs and my students still struggle. I have tried to teach the verbs in context, through rhymes, straightforward and in songs but to no avail. However, the last method, using picture rhymes was quite successful, so here I come with another set of 18 irregular verbs. In this post there is the infographic with all the verbs, a simple worksheet and two games to practise the irregular verbs in English. I hope you find this activity useful. Go through the infographic with your students. 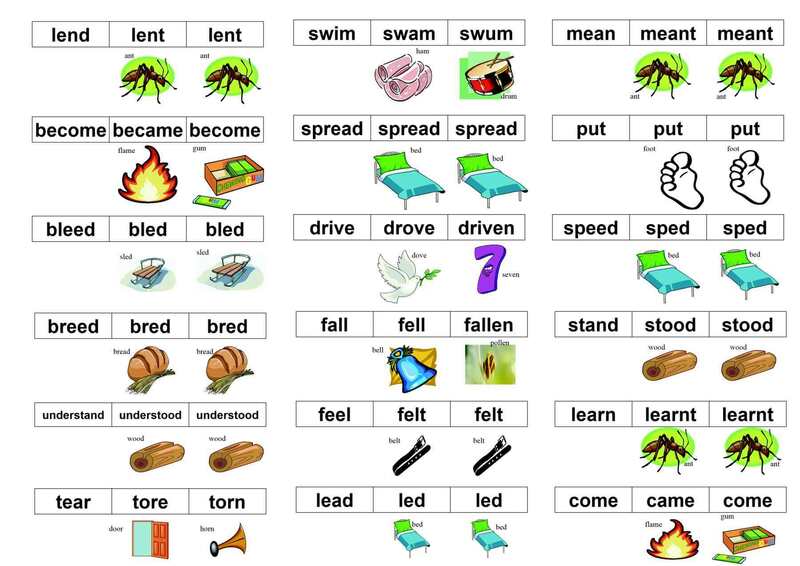 Read the words aloud and explain that the words in the pictures rhyme with the past tenses and the past participles. Give your students time to study the words (about 4 minutes should be enough). Now hand out the second page of the worksheet and ask the students to write the past tenses and past participles of the verbs using the picture clues. The first game is called Penalty Shootout. In this game you should choose the correct past tense and past participle of each verb and then try to score a goal. Good luck. The second game is called Fling the Teacher. To win the game, you have to answer all the questions by choosing the correct forms of the given verb. If you answer all the questions correctly you will fling your teacher. (But I am sure, that he/she will not mind as long as you know all the irregular verbs 🙂 ). The game is in Flash and it will only play on desktop computers.